A new book, Art + Science Now tries to amalgamate the sciences and the arts by featuring the work of more than 250 artists from around the world who have used using themes in science, kenetics and robotics in their work. Our favourite piece is DFA 18, Triton (shown above) and features a deformed frog (with eight legs, caused by pollution) and is the creation of Brandon Ballengée, an environmental artist who says his work "attempts to blur the already ambiguous boundaries between environmental art and ecological research". It's eye-catching stuff. 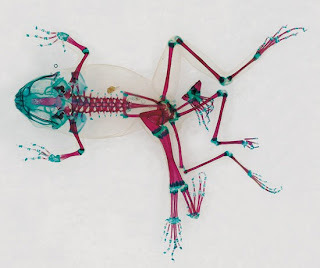 The artist, Ballengée used a chemical process to make the skin and tissues of the frog transparent, while staining the bones. Brilliant.